Is Chiropractic Care Safe For Expectant Moms? Chiropractic care benefits all aspects of your body’s ability to be healthy. When misaligned, pelvic and spinal dysfunction can result, which can create imbalances in the surrounding muscles and ligaments. All of this can affect the body’s ability to function optimally. Over 50% of all pregnant women experience back pain and approximately 75% of women report back pain during labour but some are reluctant to seek treatment. 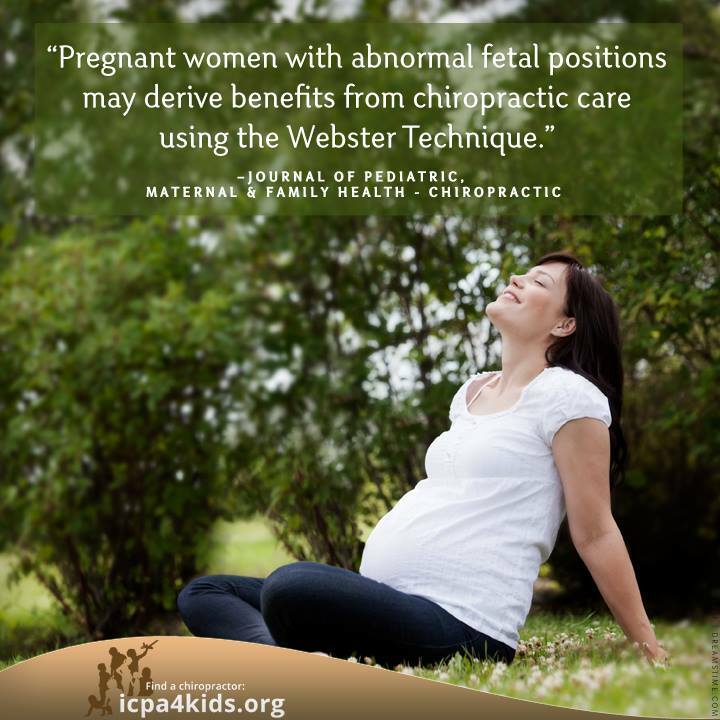 Chiropractic care is a safe, comfortable and effective treatment during pregnancy. The Webster technique is a specific chiropractic analysis and gentle adjustment technique that can be used on all populations, not just pregnant women. The goal of the adjustment is to reduce the effects of joint dysfunction in the pelvis. In doing so, optimal movement and function of the pelvis and surrounding structures can be restored. Common symptoms that can be relieved with chiropractic treatment during pregnancy are: low back pain, sciatica and joint dysfunction. In some women, pelvic dysfunction can contribute to difficult labour for the mother (commonly known as dystocia). Dystocia can be caused by inadequate uterine nerve function, pelvic contraction, and baby mis-presentation (breech positioning). Correction of joint dysfunction and pelvic misalignment may have a positive effect on all these causes of dystocia by addressing the tightening and torsion of specific pelvic muscles and ligaments. Obstetric literature has determined the importance of normal pelvic biomechanics for the prevention of dystocia and difficulty during labour. The adaptations that occur in the female body during pregnancy include the increase of hormones, weight gain and postural adaptations. All of these result in pregnant mothers having a greater chance of sacral dysfunction and biomechanical imbalance than the general population. These can easily be corrected safely and comfortably throughout pregnancy and following labour. Gentle chiropractic techniques can also be used effectively in the care of children but that’s a topic for another day – to be covered later. I’ve seen a few headlines lately reporting that sitting is as bad for us as cigarette smoking. How is that possible? We obviously know by now that smoking is very bad for our health and can increase our risk for cancer and a number of other frightening diseases, but what’s so dangerous about sitting? It turns out, the problem here isn’t sitting down and taking a rest for a few minutes, but it’s the increasingly SEDENTARY nature of our jobs and our lives in general. Not only are we sitting at our jobs more than ever, we’re doing less and less physical activity outside of work. And it’s not just that we’re getting lazier – we’re putting our health at risk. It’s not a coincidence that diseases like obesity, heart disease and diabetes are affecting us more than ever. And what’s worse, it’s affecting our teens and kids too. Our bodies were meant to move! But as activity has decreased and technology has increased, we’ve seen a rise in headaches, back pain and other chronic conditions. Which isn’t surprising because prolonged sitting causes certain muscle groups to tighten and shorten, while others become weak. Once this pattern is in place, pain and/or dysfunction isn’t usually far off. So what’s the solution? Quit your job and throw out your laptop. Kidding. Quite simply, we need to interrupt this pattern. This means that we need to take breaks every half hour or so: stand up, walk around, change your posture, fidget. Limit your TV and/or screen time when you’re not at work and do the same for your kids. Be more active. You’ll feel better and your body will thank you.